October pending sales rose 3.3 percent to 4,331 contracts. 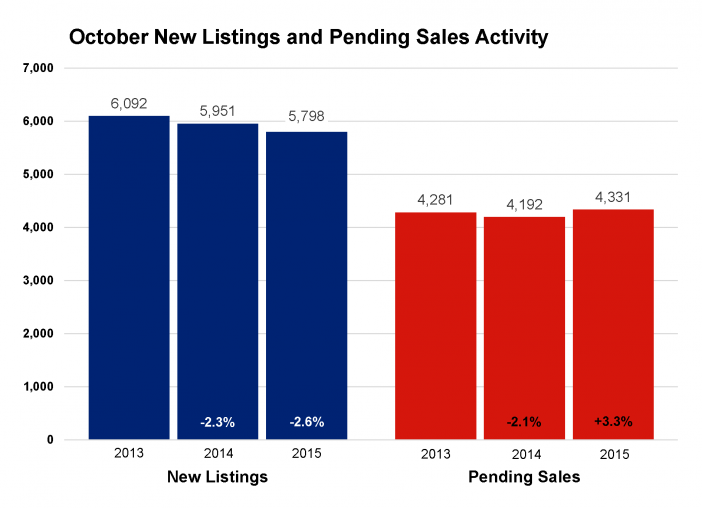 New listings decreased 2.6 percent to 5,798 as fewer sellers listed their properties for sale. It should come as no surprise that inventory levels fell 16.7 percent to 14,911 active units—extending a long-standing supply crunch that is frustrating some buyers but helping sellers yield multiple offers. As one might expect, prices thus continued to rise with the median sales price increasing 4.9 percent compared to last October. That is wholly in line with long-term year-over-year appreciation before factoring for inflation. The median list price rose 4.4 percent to $240,000, while the average price per square foot rose 3.2 percent to $127. With tight supply and strong demand, sellers accepted a larger share of their original list price as offers were more competitive. The percent of original list price received at sale was up 1.1 percent to 96.2 percent. Homes tended to sell in less time. Days on market declined 2.8 percent to 70 days. Both of these trends are consistent with a sellers market. Further evidence that it’s a good time to sell came by way of months supply of inventory, which fell 25.6 percent to 3.2 months of supply. Generally, five to six months of supply is considered balanced. While the metro as a whole is favoring sellers, not all areas, segments and price points reflect that. Other market measures show ongoing improvements as well. The percentage of all sales that were foreclosure or short sale has shrunk to less than 10.0 percent. Sales activity in the lower price ranges ($150,000 and below) is declining while activity in all other price ranges is rising. At the high end of the market, year-to-date sales activity in the $1,000,000 and up range has reached all-time record highs. Though it’s not yet the case for the entire region, home prices across several local markets including St. Louis Park, Edina and Southwest Minneapolis have also reached record highs. The broader economy has been favorable to market recovery. The October jobs report not only beat expectations but it also showed the strongest wage growth in six years—a critical factor that will offset declining affordability and help with down payments. Unemployment has been cut in half from its peak and consumer confidence is rising. October Bureau of Labor Statistics figures show the Minneapolis-St. Paul-Bloomington metropolitan area had the lowest unemployment rate of any major metro at 3.1 percent compared to 5.0 percent nationally. Mortgage rates are still around 4.0 percent compared to a long-term average of over 7.0 percent. A rate hike at the Federal Reserve is expected in December, though changes in mortgage rates will be slow and incremental.